Last weekend we welcomed our latest member to our family, baby Riona. 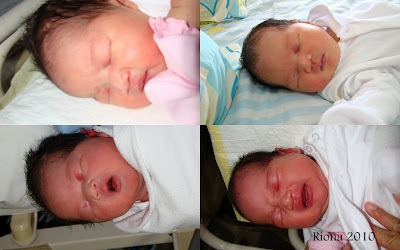 She weighed 3.2kg and was 50cm long when she was born on Sunday. Before she was born we were wondering about what her blood group would be as hubby and I are of different blood groups. He is B+ while I am O+. The boys both take after him as their blood group is B+ and I wondered if #3 would be the same too. Surprisingly her blood group is different and she takes after me with a O+ . It’s strange how the different genes get passed down from one generation to another. Here is a questions for all the readers here. Here is a collage which I did last year of the boy’s newborn photos and our photos. I would really like to read about your guesses in the comments below. She is so cute! What a gorgeous baby! She’s beautiful! So she’s a year old now? Happy birthday to her! 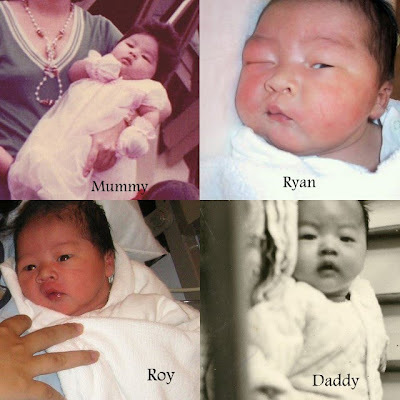 Comparing the newborn photos, I think she looks like Ryan the most. Now that she’s older, who do you think she looks like? Visiting you from the time travel. Yes she just turned one year old a few days ago. Thanks for the birthday wishes. She does look like her eldest brother Ryan a lot however now I feel that she has her own distinct look. She too looks like me when I was a baby.